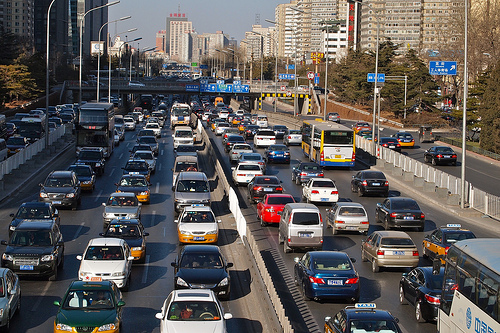 The Carnegie Endowment for International Peace released a new report last week as part of its Energy and Climate Program on China’s fast-paced motorization and possible strategies to reduce greenhouse gas emissions due to the increase in vehicles. Below is a summary of the report. The report strongly advocates for the introduction of efficient public transit systems in China’s cities and recommends the adoption of clean energy vehicles. In terms of effectiveness, the report is a proponent of bus rapid transit (BRT) systems that are low-cost in construction and maintenance, but also in pricing for passengers, which can have a significant effect on ridership. “A typical urban subway system in China can remove as many as 4 million autos and motorcycles from the road, whereas buses—including bus rapid transit systems—may obviate the need for 19 million more vehicles,” the report says. But even the adoption of clean energy vehicles may not be sufficient to improve—or even maintain—quality of life, according to the report. Even a radical transition towards electric and hybrid vehicles still entails dramatic consequences simply due to the sheer volume of vehicles occupying China’s roads. Alternatives to cars and other motor vehicles—bus rapid transit, rail mass transit, bicycling, walking, and intermodal freight movement—will be key, the report adds. Alternative mobility options should be the focus of urban development in order to compete with private vehicle ownership. One advantage China has over western economies is the novelty of its car culture and the still burgeoning phase of its oil-dependent transportation system. According to the report, western economies are at a disadvantage because of the maturity of their oil-dependence. The report recommends controlling air quality by spurring innovation for clean vehicle and fuel technologies, including adopting and enforcing the European emission standards, Euro VI , to place a cap on particulate emissions from all vehicles, and controlling technologies on new and old petroleum refineries. The report also recommends commercializing electronic vehicles and advancing smart electric grids, including developing light-weight vehicle materials to increase efficiency and range, as a second suggestion. A third suggestion is the need to develop policies to promote vehicles with near-zero greenhouse gas emissions. Fuel quality standards are an important part of managing transportation emissions, which is why the report recommends China to bring the standards for gasoline and diesel up to those of the EU and U.S., especially since the quality of fuel is directly related to optimal engine operation and emission control systems. The report emphasizes the importance of enforcement mechanisms and cites a pilot zone taxing system to implement vehicle and fuel quality standards. Polluter-pay principles are a fourth strategy the report recommends, which would require the creation of a robust economic and fiscal framework for transportation. The report points to America’s resistance to institute market mechanisms that price externalities to minimize undesirable social effects of transportation as one consequence of failing to enact a fiscal framework. Finally, the report suggests enacting land use policies that limit urban sprawl and discourage the dependence on private vehicles. With the urban population growing, it is inevitable that the boundaries of cities will expand outward, and the access to urban opportunities will increase incomes, which will then make private vehicle ownership more accessible. “And once land is developed, it is very difficult to reverse course and reintroduce more efficient transportation options,” the report adds, which is why designing development around interconnected public transit services is especially significant. This will also require investments in transit infrastructure and smart growth strategies. The report also introduces the importance of employing real-time information technologies to foster mobility options and ease travel planning. China’s new role in the world economy will allow its decisions to influence energy and environmental outcomes around the world, the report concludes. The nation’s choices in motorization will have a great impact on a local, national and global scale.